In many cases, serious eye diseases have no symptoms. For example, Glaucoma can cause vision loss, but has no pain or visual disturbance until the disease is well under way. Macular degeneration and cataracts develop so slowly that you may not even realize that your vision is changing. For diabetics, Diabetic Retinopathy is one of the leading causes of blindness. Early detection of these and other eye diseases is one of the most important reasons to have your eye exam done by an optometrist or ophthalmologist with experience in diagnosing these conditions. 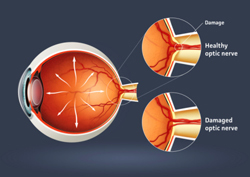 Glaucoma refers to a group of eye conditions that lead to damage to the optic nerve, the nerve that carries visual information from the eye to the brain. In many cases, damage is caused by increased pressure in the eye. This is known as intraocular pressure. Open-Angle Glaucoma symptoms are very subtle. The most noticeable is the gradual loss of peripheral vision. In Angle-Closure Glaucoma, symptoms may come and go or steadily worsen. Some symptoms include sudden severe pain in one eye, decreased or cloudy vision, nausea and vomiting, rainbow-like halos around lights, red eye and a feeling that they eye is swollen. Congenital Glaucoma first appears when a child is just months old. Symptoms include enlargement of one or both eyes, sensitivity to light and tearing. Treatment of glaucoma depends on which type of glaucoma is present. Glaucoma is treated by an Ophthalmologist. Macular degeneration is an eye disease that damages the center of the retina, which is called the macula. This makes it difficult to see fine details. People affected by macular degeneration may not have symptoms at the onset. As the disease progresses, central vision may be affected. Macular Degeneration usually falls into one of two categories; wet or dry. The most common symptom in dry macular degeneration is blurring in the center of the field of vision. In many cases, objects in the center of vision appear distorted and dim, and colors look faded. Reading print or seeing other details may be difficult, but walking and routine activities are not impaired. Peripheral vision is not typically affected. This prevents complete vision loss as the disease progresses. In wet macular degeneration, straight lines appear distorted and wavy. There may also be a small dark spot in the center of vision that gradually grows larger. Central vision loss can occur very quickly and should be a sign that an appointment with a retinal specialist is crucial. A Cataract is the clouding of the lens of the eye. Most cataracts are formed as people age, but can also be the result of an eye injury or other health conditions, such as diabetes. 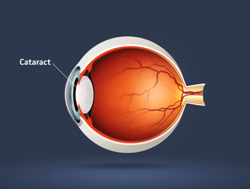 Symptoms of cataracts may include Cloudy or fuzzy vision, severe glare from the sun, difficulty driving at night, frequent changes in eyeglass prescription, double vision or improvement in near vision in farsighted people. As a cataract progresses, more of the lens becomes cloudy. Once the entire lens is white, it causes severe vision issues and must be removed surgically. Your eye exam can determine if you are showing signs of developing a cataract. Diabetic Retinopathy is the most common complication of diabetes and is the leading cause of blindness in American adults. This condition is caused by uncontrolled high blood sugar. 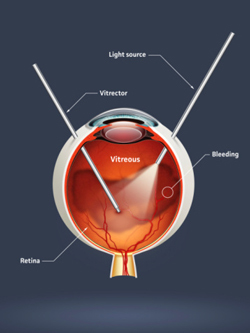 The retina has a rich supply of blood vessels and when the blood sugar levels become too high, these vessels weaken. The weakened vessels leak blood and fluid into the retina. New vessels grow but they are weak as well and may also leak. This results in swelling in the retina leading to blockage of nutrients and oxygen flow, which leads to vision loss and potential blindness. In the early onset of this condition, there are no real symptoms. This is the time when a comprehensive eye exam can be the diabetics best prevention. As retinopathy progresses, specks, spots or floaters may become noticeable, central vision may become blurred or change focus. Other people may notice difficulty seeing at night. 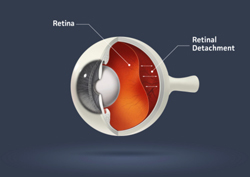 Retinal Detachment is a condition where the retina, the light sensitive neural cells that transmit vision to the brain, becomes separated from the tissue that feeds it nutrients and oxygen. This is an emergency and should not wait for your next eye exam. Symptoms of retinal detachment include floaters which look like gray spots, strings or spider webs floating in your field of vision, flashes of light, a dark curtain or veil moving over your vision.